If you are HP Laptop user then here is Awesome Offer for you. Now explore Jio in HP too! Read More to know about this offer. What is the HP-JIO Fi Offer? 4. Customer will need to fill a KYC form and submit an address proof and an identity proof before getting their JioFi device.The customer can apply for either prepaid or postpaid services. 6. Customer will get a call on their registered number for tele-verification within 7 days of getting the device. 7. As soon as the tele-verification is complete, the device and the offer will get activated. ● VoLTE calls and app to app sharing possible. ● Can host upto 31 devices simultaneously. ● Has 6 hours of battery backup and is fully charged within 3 hours. ● Comes in 3 colours; Red, Blue and Black. ● Priced at Rs 2,899 only. 1. The offer is valid exclusively for HP users. 2. 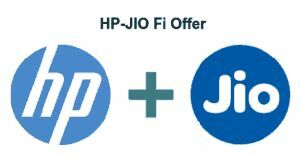 The offer is valid for only those HP users that have received the message with the HP-Jio Fi offer. 3. Jio Preview Offer is valid only for 90 days after activation.